It’s not easy being a ghost. Your continued existence hinges on not being seen, and the only time you can deal with people is when you catch them completely unawares. Otherwise they’ll not only be unfazed by your efforts to remove them, but will also be able to easily overpower you with their superior weapons and legion of friends. Indeed it’s hard not to feel a twinge of jealousy towards the other guy who just charged on in and took on the whole room with their flashy abilities and deadly assortment of cool gadgets. It looks like they’re having a grand ol’ time, leaving you wondering what could ever possessed you to think that being a ghost would be good for you. It’s not easy to get through a heavily guarded base without being seen, nor should it be. Stealth isn’t easy, and that’s why successfully being stealthy is so much fun. The problem is that in stealthy games, or games that support a stealthy approach, there aren’t nearly as many options available along the sneaky path as there are along the direct alternative. Sometimes the stealth works well but winds up feeling at odds with the rest of the game, as is the case with games like DisHonored. In other games like Deus Ex: Human Revolution the stealth features are robust and in tune with the game, but suffer from design decisions that failed to take it into account. In either case, we’re left with games that wind up pushing players into other paths despite on the surface presenting stealth as if it were just as valid an option as the direct approach; something I feel is particularly true for Dishonored, albeit in kind of an odd way. 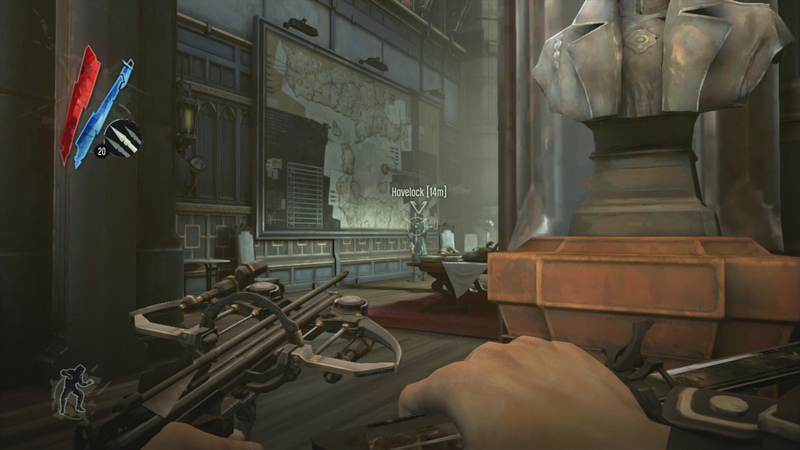 For DisHonored, the issue is one of confusion. While not outright advocating for stealth, the game makes certain that its players know that the nonlethal approach is the “good” way to play the game. Since your nonlethal option doesn’t work in direct confrontations, at least until you’re able to buy a specific upgrade, the best choice for a nonlethal run is to try to be a ghost. Corvo Attano has three abilities at his disposal for this: “Blink” (teleport), “Dark Vision” (seeing enemy positions, movements, and vision cones) and “Bend Time” (slow/stop time). There is another nonlethal ability called “Wind Blast”, but that one is based around blowing enemies back, so it’s not exactly stealthy. These along with sleep darts are helpful, but limited when compared to the goodies a lethal and direct Corvo gets: Pistol (with three different lethal ammo types), crossbow (with two lethal ammo types), and spring-traps just to name a few. It’s highly satisfying to complete a stage without being seen or killing anyone, but one has to wonder if the game really wants the player to play that way when there are so many other, more action-oriented ways to complete it. It’s odd to say the least. The game says killing is bad and you should avoid confrontation as much as possible, but most of the tools available are meant for the more direct and bloody approach. It winds up feeling dissonant, and in my case I couldn’t help but wonder if my dedication to stealth was causing me to miss out on the real game. In Deus Ex: Human Revolution, the problem is that the game supports the stealth option right up until it doesn’t. There’s a fair amount of upgrades to support a sneaky Adam Jensen. He can be given better hacking software to reach out the way places. He can be given greater awareness of what his enemies can see. He can be granted literal invisibility for slightly increased increments of time. The key problem is that all of these require energy to use, which leads to a consumable-oriented inventory with maybe enough room for one large gun and perhaps a small gun later on. This leads to our second problem: ineffectual nonlethal weapons. The game offers only two quiet weapons by default: a taser and a dart rifle; both of which can only be obtained once and have very little ammo available throughout the entirety of the game. Silencer modifications are available for the lethal weapons, but they aren’t generally available until making it to Hengsha, and even then they aren’t easy to find. That leaves precious few options for a stealth-oriented Jensen, none of which are of any use in any of the mandatory boss fights. Adam Jensen may truly wish that he was Batman, but he simply isn’t. He needs both an effective weapon and ammo enough to bring down a bullet sponge, neither of which a ninja-jensen would normally have on-hand. It’s as if the boss fights exist in an entirely separate game; one in which a stealth option doesn’t even exist. Stealth needs to be an all-or-nothing affair. If it’s going to be included in a game, then it should be just as viable an option as direct confrontation. I’m all for stealth being more difficult than direct methods, but I want to feel like I’m still playing the game correctly, and not missing out on a lot of the fun, when I choose to ghost my way across a level rather than shooting the place up. Thankfully, there’s some hope on the horizon. Both DisHonored and Deus Ex: Human Revolution are getting sequels in 2016, and the developers of the Deus Ex sequel have already confirmed that stealthy players will be better supported this time around. Hopefully DisHonored 2 will do the same and give us more sneaky gadgets to play with. What annoys you most about stealth games? If you’re a DisHonored fan, what changes are you hoping to see in the sequel? Good stuff and relevant to me as I just started playing through Human Revolution again. I ran into the “battery” issue you mentioned last night which surprised me because I completely forgot about that mechanic. I tried to take out a guard, only to see and hear the battery warning instead. This is especially noticeable when compared to other stealth games, like Splinter Cell Blacklist, which, is still one of my favorite stealth games ever. That’s a game that gets stealth right. I feel like Dishonored 2 will be much better with stealth, especially because of another protagonist added to the mix with Emily. I’m guessing she’s the more stealthy of the two and should have an interesting skill set to better support that style. Hopefully Emily will be focused on stealthy gameplay, or at least have more than just a handful of upgrades for quiet and/or non-lethal takedowns. I’m certain that getting the “less chaotic” ending will still require non-lethal actions. Yeah, I’d imagine they’d stick to a similar system from the first game. I haven’t played Dishonored so I can’t speak to that. I do happen to be a big Deus Ex fan and I have to disagree with you when it comes to this game. Boss fights aside, I’d argue that there are more stealth paths and options in this game than what you call “direct confrontation” by, on average, a 3-1 ratio. The very first level is a great example- you enter the warehouse through a back door on the ground level where guys are patrolling and will almost definitely enter into a gunfight. On the stealth side you can enter through the ventilation system, a door on the roof or you can sneak past the guards maybe knocking them out silently and hiding their bodies or not. I know I was also able to get a silencer upgrade before Hengsha but then again, I’m a completionist. I need to explore every single thing before moving on so maybe I found it in a locker tucked away or something. Hmm…perhaps I just didn’t do my due diligence when going through the levels then. I’ve gone through the game a couple of times, and while I was able to do it stealthily both times, I just felt like the game was always trying to push me down the direct path.